The benefits of swimming and moving in water on the physical body are well known and have been used for centuries. The buoyancy of water supports and lessens stress on the joints, encourages free movement and provides a safe environment for exercise. Canine hydrotherapy is helpful for pooches suffering from geriatrics and arthritis, paralysis and other mobility issues, pre and post surgical rehabilitation, injury prevention and rehabilitation, helping obesity, dysplasia, increasing body awareness, balance, and coordination and to just plain help fitness and muscle tone. Water both stimulates and relaxes and can affect all systems of the body on the physical level. It is non-weight bearing, thus eliminates stress on the joints. The coolness of the water allows for extended cardiovascular work outs, since there is resistance in each direction of movement MANY muscle groups are worked-vs.- on land. 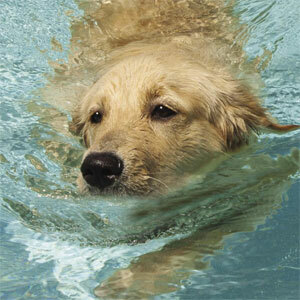 Dogs who are paralyzed on land most often begin paddling as soon as they are put into the water. A lift/platform to get them in and out safely, lifejackets, leashes and toys! You also need a filter and pump to circulate the water and keep it sanitary. Hip and elbow dysplasia, post-op for total hip replacements, torn cruciate ligaments, herniated discs as well as degenerative myelopathy, strokes, injuries, arthritis and obesity. Integumentary System: This system speaks of our skin, the largest organ of the body which wraps and protects our entire being. Water increases circulation which can help skin and coat condition, besides stimulating all the touch receptors. Muscular System: Water increases relaxation which can help reduce pain and spasms. When moving in water, the resistance is 15 – 20 times that of moving in air so muscles are being used without the stress of weight bearing. An efficient and safe way to exercise and build muscle! Nervous System: Water can calm and sooth the nervous system, thus decreasing stress. Water can stimulate the sensations of joint position and re-establish sensation channels. Circulatory System: Warm water can increase body temperature, causing blood vessels to dilate and increase circulation and detoxification, delivering nutrients and oxygen and carrying away wastes. Endocrine System: Water can increase metabolic functions and hormones which regulate many processes in the body. Lymphatic System: Water can increase lymph drainage, decrease inflammation and improve the immune system. Respiratory System: Water can increase the depth of respiration through pressure on the lungs, providing oxygen and disposing off carbon dioxide. Digestive System: Water can increase smooth muscle activity (digestion) which provides nutrients to cells and eliminates through the feces. Urinary System: Water can increase blood flow through the kidneys (which filters the blood), the body gets rid of toxins (including anaesthetic) and removes waste products. This process can help regulate and balance water and electrolytes in the body. The healing potential of immersion in water on the emotional body is profound. Anyone who is in pain knows how soothing it is to slip into warm water. A sense of well-being flows over the body and the mind begins to relax. We were all (canines too) held in warm fluids for the first part of our lives. This was a time of safety and being taken care of. The influences at the cellular level of being held in warm water are intensely profound on the emotional body. Back to canine water therapy, there are two sets of emotions involved here. We have our canine friend who may be getting older, losing mobility, has become disabled in some fashion, has some fear or pain around recent surgical or medical procedures, etc…. and then, just as important, we have that dog’s guardian – the person who is seeking options for help for their best friend who is in need. The bond that usually exists between a dog and their pet parent can be beyond words and any pain or disease can bring up fear and emotional pain for the person. Japanese author Masaru Emoto has shown how the molecular structure of water changes with emotion. He has photographed molecules of water which have been infused with an emotion and his photographs show how water is alive and highly responsive to every one of our emotions and thoughts and takes on its environment. Although a therapist cannot change someone’s emotions but can create an environment to help facilitate a change in their emotions, an environment that encourages thankfulness, joy and reduces stress. It is at the top of my list of priorities in a hydro-therapy session that the dog in my arms feels safe. I am also aware of this dog’s person at poolside and I am mindful of being respectful and nurturing to their emotions as well. Finally, I take special care of my pool water in a respectful way so that it can partner with me on my mission to do what I can to help restore health. (Cindy Horsfall owns and operates La Paw Spa (www.lapawspa.com) based in Carlsborg, Washington where canines and their companions receive pampering, understanding and therapy. Trish Penick is an expert in deep water swimming who establishes Cutting Edge K9 Rehab (www.CuttingEdgeK9.com) receiving referrals from vets throughout San Diego, LA and other counties). It was one of those good days, the kind that makes you glad to be alive. It began when I met Sarah and ended as I drove home under a beautiful sunset sky that matched the warm glow inside of me. Sarah is a six years old lab who has had some spondylosis in her spine. She is a perfect candidate for water therapy and enjoyed her session today, but that’s just part of the story that made this day such a good day. People often ask me: “What is canine water therapy?” My response has always been something about tennis balls, splashing retrievers, warm water massage and devoted canine companions. I have always known how profound this work can be, but now, thanks to Sarah, an entirely new dimension of this work has emerged…. one that truly encompasses the power of love, family and that network of existence and support of which we are all a part. Sarah is lovingly taken care of by two devoted and amazing people. The husband of this team was left brain damaged in a terrible climbing accident 18 months ago and neurologically impacted to the point where he is unable to use his left arm and leg without excruciating pain. The rehabilitation specialists have suggested that he try warm water therapy, but he is afraid and has resisted this idea. He read an article about how water therapy can help our canine friends and when he read this story, he decided he wanted to have his Sarah be in the warm water… and that perhaps he would get in the water with her so that she wouldn’t be so afraid. They all arrived at the spa today for Sarah’s session. I carried Sarah into the water and this man’s devoted wife and my wonderful assistant helped him into the warm water to be near his dog. I held Sarah close to him and she gave him kisses as he found his balance in the water. Over the next hour, he began to move his arm and leg without pain. He even tried to walk and venture out into the water with his beautiful, loving dog at his side leading the way. He laughed and told me his story and we all enjoyed the warm soothing waters of the spa together. I fought back the tears many times during that session as a new, larger definition of water therapy grew in my mind. A definition that includes canine angels leading their beloved people to where they need to be… and the many gifts this work gives to me and my clients, gifts that aren’t wrapped in paper or tied in ribbons, but held in the heart with a warm glow that matches the sunset at the end of a really good day. Thank you Sarah.